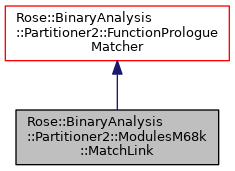 Matches an M68k function prologue with LINK instruction. Matches a "LINK.W A6, ###" instruction where "###" is zero or negative, and creates a function at that address. Definition at line 17 of file ModulesM68k.h. Definition at line 22 of file ModulesM68k.h. Definition at line 23 of file ModulesM68k.h. Attempt to match an instruction pattern. If the subclass implementation is able to match instructions, bytes, etc. anchored at the anchor address then it should return true, otherwise false. The anchor address will always be valid for the situation (e.g., if the partitioner is trying to match something anchored at an address that is not in the CFG, then the anchor will be such an address; if it is trying to match something that is definitely an instruction then the address will be mapped with execute permission; etc.). This precondition makes writing matchers that match against a single address easier to write, but matchers that match at additional locations must explicitly check those other locations with the same conditions (FIXME[Robb P. Matzke 2014-08-04]: perhaps we should pass those conditions as an argument).